Check this great site out if you want to learn more about medieval life, history and customs. It is indispensable for fantasy writers or people interested in the medieval world. I adore this site. And here are a few articles about the subject. 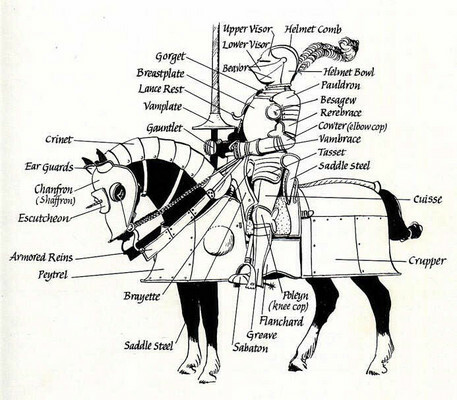 I wanted to make this post for writers, such as myself, who can become confused at what the names of certain parts and components that make up armor as a whole. This drawing illustrates a fully mailed and plate armored knight atop a similarly armored stallion. While this type of armor wasn't as common as say a suit of chainmail, a vest of boiled leather and a metal helmet as most bannermen, mercenaries, yeomen and even most knights would generally wear; it is the most well known form of armor due to fantasy novels, films and video games. Congratulations Nick! Night Mind is one of my favorite Youtube channels and one of the few that I eagerly wait for each beautifully made video. If you like horror or scary things in general you can't go wrong with ol' Nick Nocturne's great videos and deep, terrifying at times voice. I can't recommend it enough. I've literally loved every video this man has made. Also don't forget to check his Tumbler often. You never know what you might find on there. And hey, why not ask the man a question while you're at it?